Let's pause here and take a moment to appreciate this book's cover. (I didn't mean to make the image so huge, but the smaller size is too small for proper appreciation.) I love the simple illustrations and the clean font and the sea green colour that does not show up very well on a computer screen. This is a lovely little book and I liked holding and reading it. One of my all-time favourite, five star books by Oyeyemi is White is for Witching. 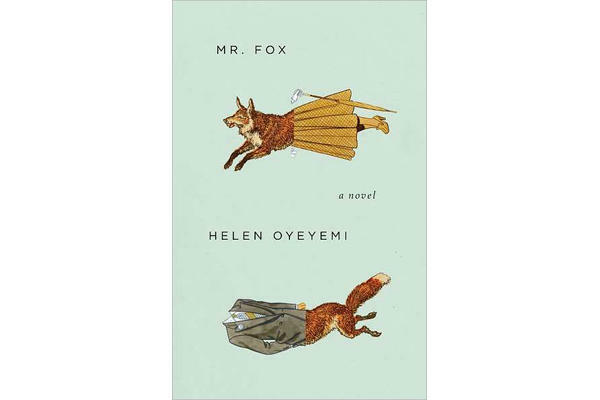 Mr. Fox is a very different story from Witching, but it invokes the same feelings in me. This feeling is sort of similar to the feeling I get when reading stories by Murakami - it's the same basic idea but a different variety. This is getting very meta, so perhaps I should attempt to explain this feeling; however, as I said in my last book post, it is difficult to describe. It's a feeling of getting so involved with a book nothing else exists. You are in the story, you are part of the story. It's a calming sensation, a very peaceful one. The difference between how Murakami makes me feel and how Oyeyemi makes me feel is that Murakami's characters draw me in, while Oyeyemi's writing draws me in. Murakami's prose has a lulling effect on me; I read it and absorb it and it holds my attention but it doesn't dazzle me - his writing is there to convey the story and it does its job. Oyeyemi's prose is the opposite. Perhaps her story or characters don't engage me like Murakami's do (I would like to stress that this is a personal feeling and not a comment on the technical 'goodness' of either author's writing ability) but the words she uses and the way she says things catches me and keeps me glued to the book. This is why I am so pleased that the book, the physical object, is so visually appealing - it is appropriate for the words contained within. (I think that says a lot about why I prefer certain physical books over e-books. That emotional connection that you get from being able to touch the words, see the physical story, isn't the same with digital text. Again, it's a difficult feeling to describe [I am bad with feelings, evidently] but anyone who feels the same as I do will understand.) This is all very difficult for me to explain, to describe these feelings and their causes in the right way, but I think this is the best I can do. I marked a few of the stories and bits of writing that I liked the most. Luckily I own this book so I haven't had to return it to the library... I'm not familiar with the tales surrounding Reynard (only found out he's a character with a past when I read some interviews with Oyeyemi), but the story with Reynardine is one of my favourites. Just, the writing, really, that did it for me on that one. This quote appears in that story, and I marked it because it's about writing. Brown worked for days. She didn't know how many days - afterwards she would only ever be able to recall that time as a pause between two breaths she took. In between she ran through the twelve fountain pens. More appeared. She ran through blocks of paper, and more was provided. Occasionally she would feel a hand, a hand that was not her own, passing over her hair, as if blessing her. the words didn't come easily. She put large spaces betweeen some of them for fear they would attack one another. I had to get out of his study, go get the Lysol, do something, before I started kicking his things round again. That was no way to win him over. I could see him adding to Mary's side of the list in his cheery handwriting, all apples and vowels: She doesn't trash my study. I stood up. And then I sat down again, staring at the floor. I stood up and sat down, stood up and sat down. There was something on the floor. A shadow that stood while I sat. Long and slanted and blacker than I knew black could be. It crept, too. Towards me. "Oh, my god." I held my hands out. "No!" We had nightmares that night, all three of us - my mother, my daughter, and I. My mother hadn't even heard the story, so I don't know why she joined in. But somehow it was nice that she did. I liked seeing Mary develop, seeing S.J. and Daphne realize she's not quite that nice. I liked how the stories were about S.J. and Mary and Daphne and were so different, but they built on everything. Gah. I'm not being very articulate lately. I liked the fox theme, it kept things fresh and interesting. But really, most of all, I liked the writing. It is possible that I would have enjoyed this story more with better knowledge of Bluebeard stories and other fairy tales, but that knowledge is not wholly necessary to read this lovely book.